Rowling will make her screen writing debut with this film. David Heyman, who produced the Harry Potter films, will be returning as producer for Fantastic Beasts. J.K. Rowling has said that the film will start in New York, around 1920, seventy years before the Harry Potter series, and will feature Newton Scamander as a main character. It is unclear whether the rest of the film will be set in New York. Well it looks like we will have an exciting Fall 2016 to look forward to. According to Wikia: The “Fantastic Beasts and Where to Find Them” will premiere in November 2016. 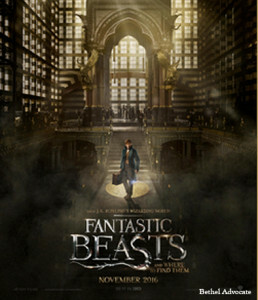 It is the first of an upcoming trilogy of films based on Fantastic Beasts and Where to Find Them, one of the companion books to J.K. Rowling’s Harry Potter series. Eddie Redmayne will star in Harry Potter prequel. The new movie follows the adventures of writer Newt Scamander and it is based on the “Harry Potter” series written by J.K. Rowling. Fantastic Beasts and Where to Find Them is a book written by J. K. Rowling for the Comic Relief Charity in 2001. Written under the pseudonym Newt Scamander, it is meant to be a copy of the in-universe book Fantastic Beasts and Where to Find Them. The premise is that the book has been released to the Muggle world to help raise money for needy causes. It features a foreword by Albus Dumbledore. Rowling will make her screen writing debut with this film. David Heyman, who produced the Harry Potter films, will be returning as producer for Fantastic Beasts. J.K. Rowling has said that the film will start in New York, around 1920, seventy years before the Harry Potter series, and will feature Newton Scamander as a main character. It is unclear whether the rest of the film will be set in New York. Fantastic Beasts and Where to Find Them tells us that Scamander had been traveling the world in research of magical creatures since 1918, culminating with the publication of his masterpiece in 1927. “ “Fantastic Beasts and Where to Find Them” opens in 1926 as Newt Scamander has just completed a global excursion to find and document an extraordinary array of magical creatures. Arriving in New York for a brief stopover, he might have come and gone without incident… were it not for a No-Maj (American for Muggle) named Jacob, a misplaced magical case, and the escape of some of Newt’s fantastic beasts, which could spell trouble for both the wizarding and No-Maj worlds. normally would drop the device and purse rather than rather than to call attention to himself. Chances are if you have in kids that are in school, that the location might be the most important feature. money has made since the deposit was given. to do this, SEO Marketing is employed. Don’t imply that you’re just going to waffle on a bit about the subject. The sole thing We can have to say is tha Smart Balance Wheel http://adf.ly/6249830/banner/www.fashionhoverboard.com are incredibly excellent Simply put i no more than desire you made an extensive box variety. I simply want to mention I’m all new to blogs and honestly liked your web site. Probably I’m planning to bookmark your blog . You surely come with really good well written articles. Regards for sharing with us your blog. I thought this submit was once good. I don’t recognize who you’re however definitely you’re going to a famous blogger when you are not already. Thanks for sharing your thoughts about reputable financial. Hi, I do think this is a great site. I stumbledupon it 😉 I may come back yet again since i have bookmarked it. I am not saying your information isn’t good, but suppose you added something that makes people want more? one thing that I believe I might never understand. It seems too complex and extremely wide for me. Un chauffagiste sur Jeux de mots va t’il nous ouvrir des vannes serrurerie ? you’re in point of fact a excellent webmaster. The site loading pace is amazing. It sort of feels that you are doing any unique trick. Also, The contents are masterpiece. you’ve done a excellent process on this matter! Hiya, I’m really glad I have found this information. Today bloggers publish only about gossips and internet and this is actually irritating. A good site with exciting content, this is what I need. Thanks for keeping this website, I’ll be visiting it. Do you do newsletters? Can’t find it. I truly wanted to type a brief message so as to express gratitude to you for these awesome concepts you are giving at this website. My prolonged internet search has finally been recognized with good quality facts and strategies to share with my friends and family. I would state that that we visitors are truly fortunate to exist in a fine website with very many awesome individuals with beneficial guidelines. I feel truly lucky to have seen the website and look forward to really more fabulous moments reading here. Thanks a lot once more for a lot of things. I precisely desired to say thanks once more. I am not sure the things I could possibly have achieved without the type of pointers provided by you concerning such a industry. Completely was a frightful scenario in my position, nevertheless looking at the well-written technique you dealt with it forced me to weep over fulfillment. I will be grateful for this service and as well , trust you find out what a powerful job you happen to be undertaking educating the rest through the use of your blog post. I’m certain you’ve never encountered all of us. I definitely wanted to write down a simple remark in order to thank you for the nice points you are placing here. My considerable internet research has now been paid with good information to share with my best friends. I ‘d declare that we readers actually are very much lucky to exist in a great community with many awesome professionals with useful secrets. I feel really happy to have used your entire web page and look forward to plenty of more thrilling times reading here. Thanks a lot again for everything. I wanted to put you this little bit of remark to finally thank you so much once again about the magnificent basics you have discussed on this website. This has been really particularly open-handed with people like you in giving unreservedly precisely what a lot of people could possibly have offered for an ebook to help make some dough on their own, principally since you might well have done it in case you desired. These techniques additionally acted to become fantastic way to fully grasp that the rest have the identical dream similar to mine to find out lots more in regard to this matter. I am sure there are several more fun times up front for individuals who read carefully your website. hi!,I really like your writing so much! percentage we communicate more about your article on AOL? I need a specialist in this house to resolve my problem. May be that’s you! Taking a look ahead to see you. I do agree with all of the concepts you’ve introduced for your post. They’re very convincing and will certainly work. Nonetheless, the posts are too quick for newbies. Could you please lengthen them a bit from subsequent time? Thank you for the post. I would like to thank you for the efforts you have put in writing this blog. I’m hoping the same high-grade site post from you in the upcoming also. Actually your creative writing abilities has encouraged me to get my own site now. Really the blogging is spreading its wings fast. Your write up is a great example of it. Hello, Neat post. There’s a problem along with your website in web explorer, may test this¡K IE nonetheless is the marketplace leader and a large portion of other folks will pass over your excellent writing due to this problem. Great tremendous things here. I am very satisfied to look your article. Thanks so much and i am taking a look forward to touch you. Will you please drop me a e-mail? Fantastic web site. Lots of useful information here. I¡¦m sending it to a few friends ans additionally sharing in delicious. And of course, thank you to your sweat! Great goods from you, man. I have understand your stuff previous to and you are just extremely great. I really like what you’ve acquired here, really like what you’re stating and the way in which you say it. You make it enjoyable and you still care for to keep it sensible. I can’t wait to read much more from you. This is actually a great web site. I¡¦m no longer sure the place you’re getting your information, but great topic. I needs to spend some time learning more or working out more. Thank you for wonderful info I used to be searching for this information for my mission. Hiya, I am really glad I’ve found this info. Today bloggers publish just about gossips and internet and this is really annoying. A good blog with interesting content, this is what I need. Thanks for keeping this website, I will be visiting it. Do you do newsletters? Can’t find it. Howdy there, just started to be conscious of your weblog through Search engines like google, and realized that it is seriously entertaining. I’ll take pleasure in should you continue on this idea. It is perfect time to make some plans for the future and it is time to be happy. I have read this post and if I could I want to suggest you few interesting things or tips. Perhaps you can write next articles referring to this article. I desire to read even more things about it! I was just searching for this info for some time. After six hours of continuous Googleing, at last I got it in your web site. I wonder what’s the lack of Google strategy that do not rank this type of informative web sites in top of the list. Normally the top web sites are full of garbage. I’ve been surfing on-line greater than three hours as of late, but I by no means discovered any fascinating article like yours. It is beautiful value enough for me. In my opinion, if all website owners and bloggers made excellent content material as you did, the web shall be a lot more helpful than ever before. I’m just writing to make you be aware of of the extraordinary experience my friend’s princess had browsing your blog. She learned so many things, not to mention how it is like to have an amazing helping mindset to have certain people without difficulty know just exactly specified extremely tough matters. You actually surpassed people’s expected results. I appreciate you for displaying such precious, dependable, revealing not to mention cool tips about your topic to Evelyn. I have been surfing online greater than three hours these days, but I never found any attention-grabbing article like yours. It¡¦s beautiful worth enough for me. Personally, if all website owners and bloggers made good content as you did, the internet will likely be a lot more useful than ever before. Thank you for every other fantastic post. Where else may just anyone get that type of information in such an ideal method of writing? I have a presentation next week, and I’m at the search for such info. Hello there, I found your web site via Google at the same time as searching for a comparable matter, your web site got here up, it seems good. I have bookmarked it in my google bookmarks. Great amazing issues here. I¡¦m very glad to peer your article. Thank you a lot and i’m looking ahead to touch you. Will you please drop me a e-mail? Great goods from you, man. I have understand your stuff previous to and you are just extremely wonderful. I really like what you’ve acquired here, really like what you are stating and the way in which you say it. You make it enjoyable and you still take care of to keep it sensible. I cant wait to read far more from you. This is really a wonderful site. Simply desire to say your article is as surprising. The clearness in your post is simply great and i could assume you are an expert on this subject. Well with your permission allow me to grab your feed to keep updated with forthcoming post. Thanks a million and please carry on the enjoyable work. Great amazing things here. I am very glad to see your post. Thanks a lot and i’m having a look ahead to touch you. Will you please drop me a e-mail? I seriously love your website.. Pleasant colors & theme. Did you develop this site yourself? I¡¦ll immediately take hold of your rss feed as I can’t find your email subscription link or e-newsletter service. Do you have any? Please permit me recognize in order that I may subscribe. Thanks. hello there and thank you for your info – I’ve certainly picked up anything new from right here. I did however expertise a few technical issues using this site, since I experienced to reload the site a lot of times previous to I could get it to load correctly. I had been wondering if your hosting is OK? Not that I’m complaining, but slow loading instances times will sometimes affect your placement in google and could damage your high quality score if advertising and marketing with Adwords. Anyway I am adding this RSS to my email and could look out for a lot more of your respective fascinating content. Make sure you update this again soon.. Helpful information. Fortunate me I found your web site by accident, and I am stunned why this accident didn’t took place in advance! I bookmarked it. I¡¦ve read a few excellent stuff here. Definitely worth bookmarking for revisiting. I wonder how much attempt you put to make this kind of magnificent informative website. Thank you, I have recently been searching for info about this subject for a long time and yours is the best I’ve found out till now. But, what in regards to the bottom line? Are you certain in regards to the source? It¡¦s really a great and helpful piece of information. I¡¦m satisfied that you simply shared this helpful information with us. Please keep us up to date like this. Thank you for sharing. Hi there, I discovered your site by means of Google while looking for a comparable topic, your web site came up, it appears to be like good. I have bookmarked it in my google bookmarks. Hiya, I’m really glad I have found this information. Today bloggers publish just about gossips and net and this is actually annoying. A good site with exciting content, this is what I need. Thanks for keeping this web-site, I will be visiting it. Do you do newsletters? Cant find it. Thanks a lot for providing individuals with such a marvellous possiblity to discover important secrets from this blog. It is always so ideal and as well , stuffed with a good time for me and my office mates to visit the blog at minimum thrice in a week to see the fresh items you have got. Not to mention, we’re at all times fulfilled considering the astounding suggestions served by you. Selected 2 points in this post are easily the most efficient we have had. Wonderful website. Lots of helpful information here. I¡¦m sending it to some pals ans additionally sharing in delicious. And naturally, thank you in your sweat! I and my pals have been studying the great ideas located on the blog then unexpectedly I got a horrible suspicion I never thanked the website owner for those tips. All the boys are already for this reason very interested to read through all of them and now have certainly been loving those things. Appreciate your genuinely simply accommodating and then for settling on this kind of good themes most people are really eager to learn about. My personal honest regret for not expressing appreciation to you earlier. Great ¡V I should definitely pronounce, impressed with your site. I had no trouble navigating through all tabs as well as related information ended up being truly easy to do to access. I recently found what I hoped for before you know it in the least. Quite unusual. Is likely to appreciate it for those who add forums or something, web site theme . a tones way for your client to communicate. Excellent task..
I’m writing to let you know what a extraordinary encounter my daughter gained reading through your web site. She learned numerous details, most notably what it’s like to have a wonderful giving heart to let the mediocre ones really easily have an understanding of a number of grueling subject matter. You actually exceeded our expected results. Many thanks for imparting those insightful, healthy, edifying and easy thoughts on this topic to Tanya. You completed a few fine points there. I did a search on the subject and found a good number of people will go along with with your blog. Valuable info. Lucky me I discovered your web site by chance, and I am shocked why this twist of fate did not took place earlier! I bookmarked it.